Agility has become important capability of enterprises. The speed at which clients require changes, at which new regulations affect processes and services, and the simplicity with which competitors can disrupt your business as Apple and Google do these days, puts immense pressure on the company. Pressure to change quickly, to implement new technologies, to develop, to reduce the expenses or scale up effortlessly. In many businesses, being agile is crucial for survival. Agility, together with innovation, is the necessity for a sustainable business. Normally there are plans for the future, either IT or business strategy, with a set of goals pursued by the company. That is precisely where enterprise architecture comes in. Traditional EA is based on drawing extensive plans before implementation. The Agile movement is entirely the opposite, and it relays on resisting to the "Big Up-Front Design" and promotes agile adaptation to the change. Both ways have their advantages and disadvantages. Traditional EA can lead to slow companies that don't know how to adapt to the time, and only have a bunch of Scrum teams without any integration, which leads to disconnected IT and other problems in the future. However, if both approaches are used in the right way, with their strengths we can create Enterprises that can move as one giant organism without having a centralized, command-and-control management that suffocates local development and innovation. Per example - the Disciplined Agile Delivery (DAD) and Scaled Agile Framework (SAFe) move in the right direction. Below is the representation of SAFe in a simplified manner. SAFe utilizes a layered, repetitive approach where the typical agile teams can be found in the bottom layer. These teams usually deliver results in a 2-3 weeks’ frequency. 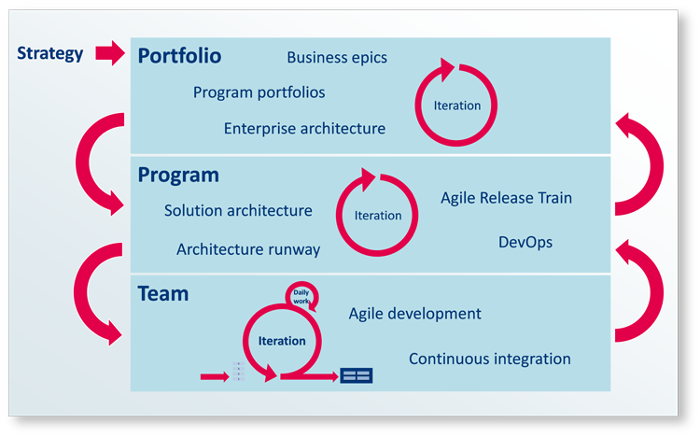 The results of these agile teams are then integrated with solution architecture concepts such as the Agile Release Train and the Architecture Runway, which ensure that everything fits in nicely. This layer repeats at speed a few times slower than the team's speed, delivering potentially finished products every 2-3 months. A lot of architecture challenges with agile take place at the Solution Architecture level. It is very, very crucial that solution architects stay at least or 2 sprints ahead in order be able to provide architecture input. At the top, big, long-term developments are positioned. This is where EA is applied. The business strategy provides context for high-impact, large-scale decisions. In this top layer, well-known Enterprise Architecture methods, for example, TOGAF find their place. In order to become more agile, EA will have to be more business-oriented, outward-looking and outcome-focused. TOGAF doesn’t require any major adaptations, specifically for the Architecture Development Method (ADM), which represent typical, extensively planned EA. TOGAF ADM itself is iterative oriented and aligns to the supports the top layer of SAFe. Also, TOGAF, SAFe, and DAD are still extremely IT-centric. True Enterprise Architecture is not focused only on technology. Instead, business architecture becomes increasingly important part of the process. A genuinely agile enterprise requires more than sole IT agility. We conclude this article with how enterprise architecture software can help in this. In general to support Agility you need to support making it easy to make changes. So when looking at enterpriser architecture software make sure that it quick and easy to make changes (change the meta-model, change models, change ABB’s and SBB’s etc. ).